When I think of Marshes I realize just how complete they are. Land, Water, Air, Light, so simple yet complete. Which answers the Estuary's part in the creation of so much life. Marsh Oil Painting on Canvass, "Aerial Antics", 8x6, by Mercedes Franklin. For Sale, The Studio Gallery, Grayton Beach FL, 850.231.3331. These 2 birds were so busy flying, playing, hit the water, flying, playing hit the next water etc. They kept me watching for quite some time. Could not get them out of my head so here they are for you to enjoy!!! Marsh Oil Painting on Canvass, "Hazy Lazy Day", 12x14, by Mercedes Franklin. For Sale, Lyons Share Gallery, 251.928.2507, Fairhope AL. This is one of those paintings that came together sooo smoothly. It is hard to put in words but when it happens it is very exciting!!! Spring time & the colors seem so appropriate. Marsh Oil Painting on Canvass, "Moonbeams", 9x12, by Mercedes Franklin. For Sale, Lyons Share Gallery, Fairhope AL, 251.928.2507. I was going for color intensity. It led me to more monochromic hues. Then came the Moon which could only lead to Moonbeams of course. This composition was more "by the seat of my pants" than usual. But I enjoy it's whimsy. Also... it really looks interesting if you hang it against a window vs the wall. Though ultimately an oil painting needs to be kept out of direct sun. But it is still worth taking a look against light before it is hung permanently. Marsh Oil Painting on Canvass, "Summer Rains", 12x16, by Mercedes Franklin. For Sale, Lyons Share Gallery, Fairhope AL, 251-928.2507. We were loading items on the back of the tractor to move them to another area on the property when it started to rain. It was great... the rain was light, the sun was quietly shinning & all was right with the world. I have had this remembrance inside me for a few years. Sometimes it just takes time to get it on canvass. Marsh Oil Painting on Canvass, "Live Life In The Sunlight", 48"x48", by Mercedes Franklin. For Sale, Lyons Share Gallery, Fairhope AL, 251-928-2507. I have been driving by this marsh for years and did not see the true beauty it had to offer. Then one fateful afternoon as i was driving along the light startled me so. I drove a short distance till I came to & turned around to take the photo. Then the fun, work, feeling of desperation started. But it is now done for all to view. I hope you enjoy. 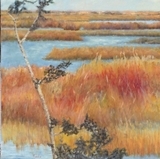 Marsh Oil Painting on Canvass, "Gray Days", 6x8, by Mercedes Franklin. Private Collection. I was driving back from a trip on a very gray day in traffic. Couldn't stop to take photos so I painted this from my memories. Next time I'm in the same area I will have to check to see just how close I was to the actual location or if I have a more vivid imagination than I thought. Marsh Oil Painting on Canvass, "Meandering Palms", 11x14, by Mercedes Franklin. For Sale, Lyons Share Gallery, Fairhope AL, 251.928.2507. I have not used many Palm Trees in my paintings but that is going to change. Each one is so unique in it's stature. They say trees speak to each other & I believe it. Marsh Oil Painting on Canvass, "Here, There & Beyond, 48"x48", by Mercedes Franklin. Private Collection. I started this painting in all the usual ways, composition, masses, colors etc. As I started the value changes in the masses I stopped to mark the canvass w/lines & notes as to where I had planned focal points as to not lose the placement. Continued painting, closed up for the evening & went to bed. The next time I looked at the canvass I saw some lines directing to an area of nice brush strokes. It was such a wonderful happening I left the lines in. 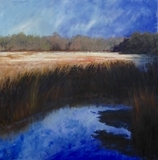 Marsh Oil Painting on Canvass, "In The Spotlight", 6"x8", by Mercedes Franklin. For Sale. This started as a study for a larger painting. What I forgot to take into account was the larger painting is a square. Therefore this composition took on a life of it's own. I am happy about it! Marshes have the best views!!! Marsh Oil Painting On Canvass, "The Traveler", 9x12, by Mercedes Franklin. For Sale. We were discussing the day to day life of birds. Where do they fly, where are their families, food, migration routes etc. Generally outlining a day in their life. When someone said "unless it is mating season". Marsh Oil Painting on Canvass, "Evening Lights Calling", 6x8, by Mercedes Franklin. For Sale, The Studio Gallery, Grayton Beach FL, 850.231.3331. This is one of my most favorite times of the day. I start new projects. Often painting, reading or just messing around in my stuff. Generally have a good nights sleep waking afresh to my 2nd most favorite time of the day. The mornings & evenings often allow for mind wondering time. Marsh Oil Painting on Canvass, "Marshians or Marshans? ", 6x8, by Mercedes Franklin. For Sale. My portrayal of the distant bushes became fodder for a friend. The fodder eventually became the name. Then came the spelling. This I leave up to you. Marsh Oil Painting on Canvass, "Magic Time", 11x14, by Mercedes Franklin. For Sale. The marsh is so alive. Some people drive by & see browns, dull greens, beige, some water. I see life in color. Marsh Oil Painting on Canvass, "Life In Between", 14x18, by Mercedes Franklin, For Sale. They say where the land meets the water, The In Between, is where all the action is. Life is very busy doing it's thing. And we are the beneficiaries of all it produces. I love this spot!!! Marsh Oil Painting on Canvass, "Blue", 18x24, by Mercedes Franklin, For Sale. Most of the time the waters in the marsh are a darkish color. But sometimes when the air is fresh, the sky clear & the reflections are perfect the waters reflect the "Blue" from above. Complete enjoyment!!! Marsh Oil Painting on Canvass, "Sunset", 16"x20", by Mercedes Franklin, For Sale. Each Marsh is so different from another. And the same Marsh can look so different itself during each day, month, yr etc. Actually my experience has shown me I have about 15 minutes at the most to capture a particular moment. They are very busy ecosystems. Marsh Oil Painting on Gallery Wrap Canvass, "View From The Yaupon Tree", 48"x48", by Mercedes Franklin, Private Collection. Marsha, Marsha, Marsha... what lies beyond yon Yaupon??? Marsh Oil Painting On Canvass, "The Kiss", 12"x24", Painted by Mercedes Franklin, Private Collection. In the beginning this painting had 1 moon, then 2 moons & finally 3 moons. I was looking for the magic spot. I took out 2 of them this time. But next time you just might see 3 moons. 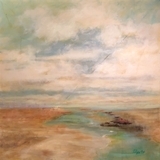 Marsh Oil Painting on canvass, "Lone Traveler", 6"x8", by Mercedes Franklin, Private Collection. All birds fascinate me, they are absolutely beautiful, wondrous flying machines & so much more of which we are unaware. 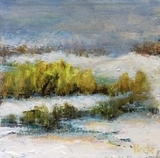 Marsh Oil Painting on Canvass, "Mist", 16"x20", by Mercedes Franklin, Private Collection. There are certain times of the year when it is great to be traveling early in the morning. This was one. To see the mist along the ground before the sun comes up is a beautiful moment of time. One never knows when this will happen. What a delight when it does. Marsh Oil Painting On Canvass, "Another Day, 6"x8', by Mercedes Franklin, Private Collection. This is one of those happy accidents. Right place right time. Can't plan such a moment. Marsh Oil Painting On Canvass, "Peaceful Thoughts", 16"x20", by Mercedes Franklin, Private Collection. Marsh Oil Painting On Canvass, "Morning Flight", 14"x18", by Mercedes Franklin, Private Collection. Marsh Oil Painting, "Red Dawn", 11"x14", by Mercedes Franklin, Private Collecion. Marsh Oil Painting On Canvas, "Three Trees", 11"x14", by Mercedes Franklin, Private Collection.